Over a lunch of cheese and crackers- typical fare in my house- I asked my kids, “What do you know about Puerto Rico?” One kid said it was an island. Another impressed me knowing that it was near a gulf. Now, I have to point out that we live in California. I’m betting our East Coast peers may know more about this Caribbean island than we do. But then I heard an answer that was really hard not to laugh out loud at, “They use American dollars that floated on the wind from America. They come every Tuesday.” I then realized we’ve got a lot to learn! And with an upcoming trip planned, of which we were very excited about, a million questions floated through my own mind. So where is Puerto Rico anyway? What is their currency? Do they speak English or Spanish? What in the world would we do in Puerto Rico if we went? Is it 135° there like my son thought, since it’s near the equator? All these questions starting spinning in our minds, so I chatted with the Assistant General Manager of Comfort Inn San Juan, Joel Roca, who shared his expert answers and tips. Now I can share them with you – and can get excited for our upcoming trip to Puerto Rico! 10. Where is Puerto Rico? Puerto Rico is a small island in the Caribbean Sea near the Dominican Republic. It is a territory of the United States, populated by 3.4 million people who call it home. The tropical climate, delicious cuisine, and rich history make it a popular destination for tourists. I’m sure the beautiful blue Caribbean Sea and sandy beaches have a lot to do with it as well! 9. Do we need a passport? If you are a US citizen traveling from the United States, the simple answer is no. Puerto Rico is a territory of the United States, so therefore passport requirements are the same as for entering the USA. 8. 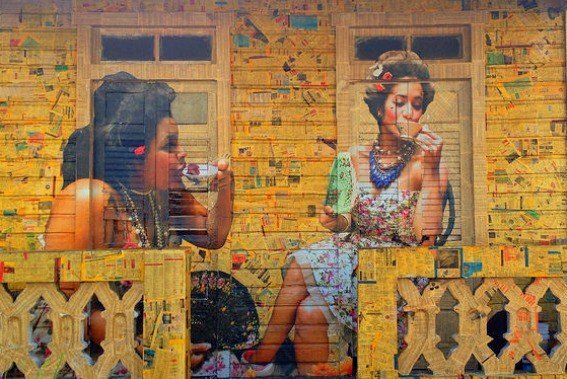 Do the people of Puerto Rico speak English or Spanish? Spanish is the primary language, as Joel told me, but most of the people have been taught English since kindergarten and it is easy for visitors to converse with them. There is no need to learn a second language to travel to this beautiful and culturally-diverse island, although speaking with the locals in their primary language is a great way to enrich your travels. And as Joel said, the people are very friendly! 7. What is the local currency? American dollars and cents are used in Puerto Rico. And no they did not float over the wind from America like my son thought, they came after Spain ceded Puerto Rico to the US in 1898. You might still hear it called a “peso”- but in Puerto Rico it’s used as a term meaning an American dollar. Be sure to take a good amount of cash or travelers checks if you plan on taking a taxi as they are cash only. Several tour companies (such as our Yunke Zipline Adventure) only take cash if you pay on the day of the visit. Most restaurants and shops accept credit cards. RELATED: Check out this guide to affordable family vacations in Puerto Rico. 6. How long is the plane flight? San Juan is a popular destination for much of the United states as it is only a 2 1/2 hour flight from Miami. Other destinations are a good distance with New York City 3 1/2 hours away, Chicago and Dallas 4 1/2, Atlanta 3 1/4, and Toronto 4 1/2. It may be an 8 hour flight from Los Angeles for me, but it’s worth it to relax on a Caribbean beach! 5. What is the weather? With an average temperature of 80°F, the gorgeous year-round summer climate is what everyone loves about Puerto Rico. Peak travel season is December to April – mostly because it’s cold in the USA! Joel from Comfort Inn told me that it is the rainy season when I come in early December. It will probably rain every day, but only for an hour or two. The temp will still be warm and perfect. Come for the low season from May to November, but be aware that it is also hurricane season. Pack light and loose cotton clothing for the tropical weather, along with a sweater for cool evenings, beach wear, and informal dress ware. 4. What is there to do in Puerto Rico besides the beautiful beach? 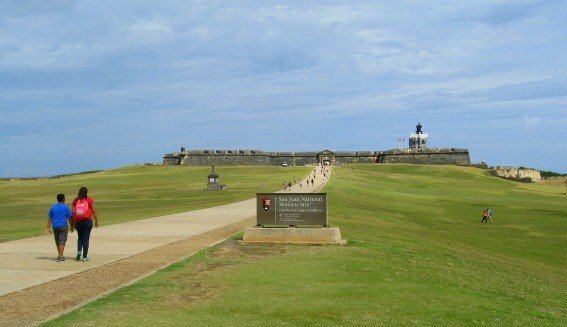 I was thrilled to learn that there is a US National Park in Puerto Rico: Fort San Felipe del Morro. Gotta collect that stamp in my National Parks passport! Joel from Comfort Inn proudly told me of how tourists also love to visit Old Town of San Juan, a convenient 20 minutes away. 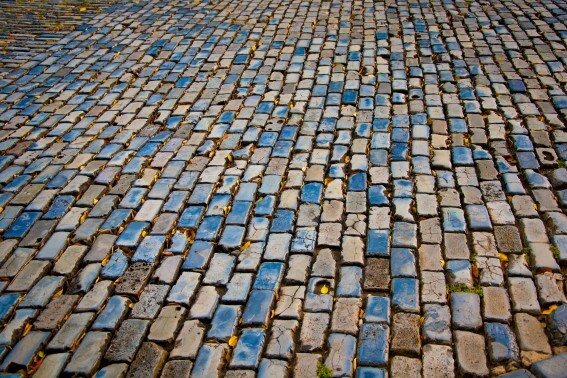 It is a 17th and 18th century history of squares, forts, and fountains from colonial days. We may take a guided hike through the misty rain forest of El Yunque and kayak through bioluminescent waters after dark. I have heard of the mysterious caves of Rio Camuy Caverns, touring coffee plantations, and tasting the incredible food. I know that I must try mofongo, which is a fried plantain dish stuffed with a variety of meats. And apparently the Puerto Ricans serve the best beans and rice in the world! When traveling with kids, all parents must be aware of safety, no matter the destination. Joel from Comfort Inn assured me that traveling to Puerto Rico is definitely safe, and my research online agreed. The people are very friendly and all are respected no matter their race. He advised to stay near the tourist destinations. And as he wisely quoted, “If you look for trouble, it will find you.” Although even in the tourist areas there are some dangers to watch out for with little kids such as deep holes in the sidewalk and construction sites with exposed dangers. Medical facilities are some of the finest among the Caribbean islands and no vaccinations are needed for travel there. Personal safety requires the same precautions as at any other tourist spot. It is neither more dangerous or more safe than most cities in the US. Take care, but don’t be worried. The food is mild and clean so no need to worry about stomach illnesses. Public transportation is safe. Stay off of beaches at night. Crime is mostly related to the underground drug trade, not to tourism. Don’t leave valuables in the car. Use the hotel safe. And know that 911 is still the number to call for an emergency! 2. Is it an expensive destination? I was pleasantly surprised to learn there was a Comfort Inn near the beach in San Juan. 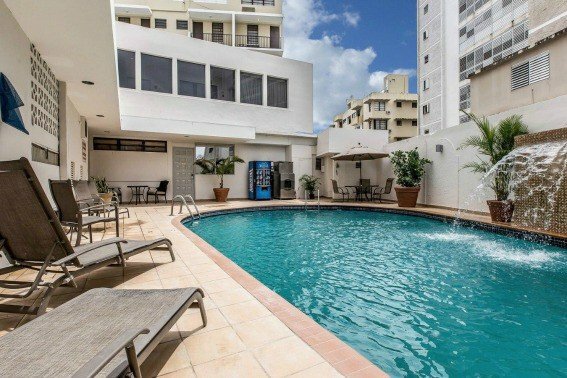 Staying at Comfort Inn San Juan is a great and affordable option to be able to explore the Caribbean on a budget and yet still enjoy a relaxing hotel. 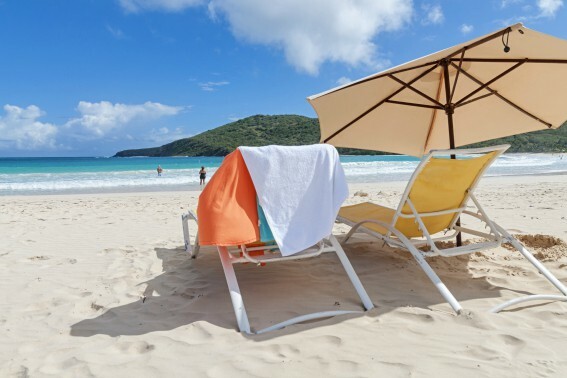 There are many fantastic resorts in Puerto Rico, and staying at a Choice Hotels property in the Caribbean is a great way to save money, with free breakfast and WiFi at their Comfort Inn locations. In addition, there are a large amount of affordable hotel options in other locations in the Caribbean with Choice Hotels, offering a range of accommodations and allowing guests to explore these new and exciting destinations. According to my online research in fall of 2016, the prices in Puerto Rico are very similar to what I would find in the continental United States. For example it is $2.30 for a cappuccino or $1 for a water bottle. However, there is a high sales tax at 11.5%. ATMs are available and all major credit cards are accepted at most places. The same tipping expectations apply. SAVE ON A SPECIAL PROMOTION GOING ON NOW! Save 20%* when you book a 3-night Caribbean vacation by December 31st and stay any time before February 28. 1. Will my phone work? Yep, this is my number one question. I do love using my computer in my pocket for social media, internet, and of course, taking pics of the beautiful places I travel to. Thankfully there is WiFi in the Choice Hotels property I will be staying in and I believe there will be no roaming charges with my AT&T plan. All tourists should check their phone plan for any additional charges, but most include coverage in Puerto Rico. Bonus Question: What About Transportation? There are many great options for getting around this beautiful island. There are public buses that run tourists through the metro areas. The bus from Condado to Old San Juan was 75 cents per person and was a clean and efficient way to travel, picking up lots of tourists on the way. Taxis can take visitors to any spot, and are a reliable way to get places. Bring cash for taxis. Uber has come to Puerto Rico as well! Download the app and ask for assistance from your hotel staff or local tour guides. 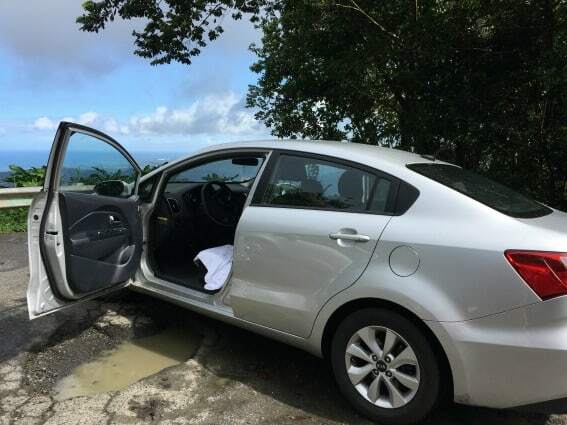 Renting a car was an excellent and economical way for our family to travel from Condado to El Yunke National Forest and several adventures during the day. Google maps works all over the island as long as you have cell service – which could be spotty in the mountain areas. Be aware that road signs are in Spanish such as salida for exit and velocidad maxima for speed limit. Also interesting to note that distances are marked in kilometers but speed limits are for miles per hour, although it only says “55” and not “55mph.” And gasoline is sold by the liter. Driving in Puerto Rico felt to me like driving at home in Los Angeles, although there were many potholes to be cautious of. Enjoy traveling around this tropical island and experience the beauty it has to offer! Disclosure: I have received a complimentary stay at Choice Hotels and am being paid to review my stay at Comfort Inn San Juan. Flights and activities are also covered. Despite this, all opinions are my own.